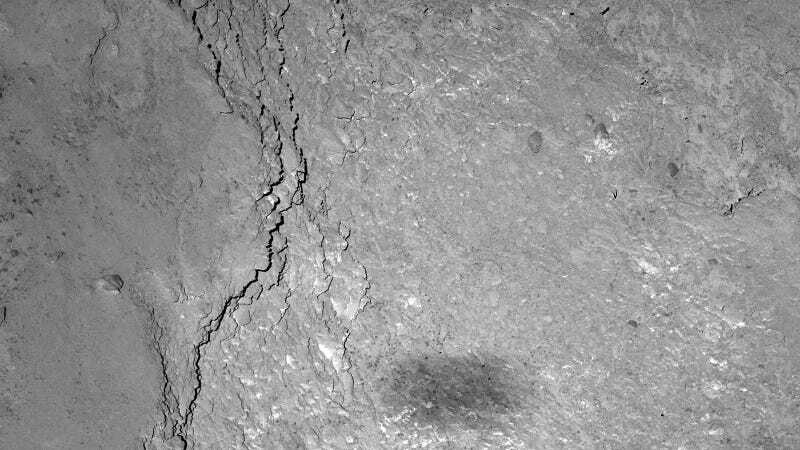 This brand new image from the OSIRIS scientific imaging camera of European Space Agency's Rosetta spacecraft reveals two fascinating things. First, we have an incredibly detailed view of the surface of Comet 67P. Second, look at that fuzzy, dark patch at the bottom of the photo—it's the shadow of the spacecraft itself! The photo was taken six kilometres above the comet's surface, during the close flyby on February 14th. The image resolution is just 11 cm/pixel, so the shadow is about as large as a half football field. Here is the full shot of the 228 x 228 meter region on Comet 67P, as seen by Rosetta's narrow-angle camera.